Amongst the vets and rural professionals close to the action that I talk to, we always saw this situation as a strong possibility. I said in my first Mycoplasma article back in August 2017 that eradication was going to be challenging and I repeated that increasingly strongly in the four subsequent articles that I wrote. For several months, my own view has been that the disease was in Southland from at least 2014 and possibly before that. But whether even that was ‘ground zero’ is a moot point. There is considerable discussion that it might have been around for even longer. And in terms of how it got here originally, there are alternative hypotheses as to the most likely pathway, but none of us actually knows. As I’ve listened to the headlines I formed the impression that MPI didn’t have any idea where the originating source of MVP was. With numbers jumping to 199 farms, it reinforces my suspicion – that they still don’t have a clue. Trying to track who brought it in it now is now a futile exercise. I really think the cull must stop now! The compensation can’t cover the heart break let alone the actual costs that infected farms are incurring. Beautiful animals are getting wasted. Peoples lives and relationships will crumble over this cull. Most (all?) spread of the disease seems to be through stock movements. That is manageable. Keep testing by all means. Try and find an effective test that is definitive and cheaper/quicker than bloods like the TB test. If we know where the diseases is the industry will manage. As the theoretic date of introduction is moving further into the past, we may find we have been managing it for the last decade without knowing. Keith, Thank you for the very good articles. I have been researching papers from the U.K, U.S. and Australia to become better informed on Mycoplasma bovis, but what has really puzzled me is why MPI cannot seem to resolve practical issues in the fishing, forestry or agriculture industries. The fact that senior managers have no education in science would seem to provide a valid answer. Perhaps in addition to strategy changes in farm management at farm level, it is time to quarantine MPI activities and cull senior managers. I have today received an email from a former senior MAF leader who has expressed his astonishment at the lack of science background within senior MPI these days. It seems that the dominant paradigm within the Civil Service is that overarching skills of management do not require an understanding of context. These managers ‘receive advice’ but would seem to lack the contextual experience to ask the key insightful questions, and thereby guide policy in useful directions. Given that humans can get sick from other species – birds, pigs, etc., why is this different? Mad cow disease transferred to humans. You write “…‘hospital milk’ to calves is a guaranteed way to spread any disease…” So the disease is present in milk. Are humans really immune to this disease? Why? Yes, the organism can definitely be present in milk. 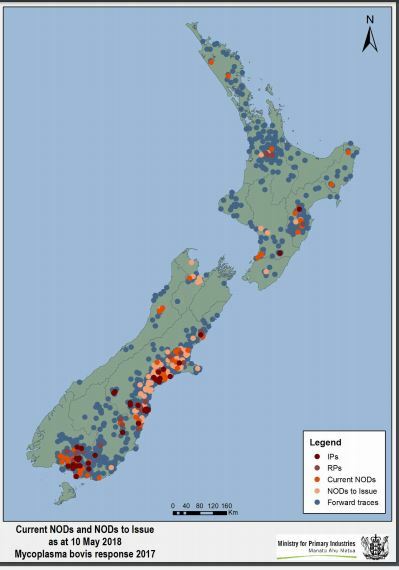 Mycoplasma bovis is a very fragile organism with no cell wall, and that may be why it does not affect humans, but that is still not a very good answer as some gram negative bacteria (i.e. those without cell walls) such as E. coli can move between species. Given that Mycoplasma is present in almost all of countries of the world I think we would know if it did transfer to humans, but so-called ‘facts’can change. To the best of my knowledge no country in the world monitors Mycoplasma at a regulatory level – it is simply up to farmers what they do about it. One thing we do know is that pasteurisation kills Mycoplasma – it cannot stand heat. Anyone who drinks unpasteurised milk needs to understand that there are lots of animal diseases that, unlike Mycoplasma bovis, can be passed to humans in unpasteurised milk. Thank you – I appreciate the detailed answer.